Sunday is here, so as new challenge at OSAAT. For today's challenge, we like for you to use your Favorite Things on your projects. My favorite thing is - Dies. I just wish i can have them all!!! 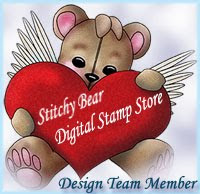 For my card i used digital image Shih-Tzu by Sue from Beary Dust Designs. You can find this image HERE. why did i picket this particular image? Well, my MIL has this kind of Dog, and she just turn 65, so this was her B-Day card from my Kids. Come join us for the challenge.